Let's do a little line up and filling in of our Beasts and characters so we can keep them straight. Having these characters straight is needed for the unraveling of Babylon and the mark of the Beast. If the Beast is wrong, the mark will also be wrong. As for the Harlot, Babylon, she rides this Beast. They are very closely associated. So getting these ducks in a row, helps me to be sure I'm at least consistent in what I see. These players are all on Satan's side. I'm not going to cover this harlot in this lesson. We are building the Beast first so we can better see who and what this harlot is. It's important that we identify her correctly, because she is the infamous Babylon the Great, Mother of Harlots. The one that God causes the 10 kings to destroy, and burn. She is thought to be the Vatican, or New York City. With Obama's foreign policy being what it is, I could almost make a case for DC as the Harlot. But it isn't. We aren't old enough, the harlot has been riding this Beast from the beginning, the 7th century. She sits on all 7 heads. If I and others are wrong about Islam being the last days empire and machine, the characters below are still in there correct position of authority and duties. If you should see another empire rising that fits the brutal description, the characters below will still be appropriate. But as of right now, I'm looking at Islam. * This is Satan. He will work behind the scenes. * He will actually give his authority, dominion, (power of attorney) over the Earth, to the Beast from the Abyss. Remember, he is the god of this world (this small corner of the universe). 2Co 4:4 They do not believe, because their minds have been kept in the dark by the evil god of this world. He keeps them from seeing the light (truth) shining on them, the light that comes from the Good News (God's gospel or Word) about the glory of Christ, who is the exact likeness of God. Eph 2:2 At that time (before Jesus was your Lord) you followed the world's evil way; you obeyed the (prince) ruler of the spiritual powers in (the air) space, the spirit who now controls the people who disobey God. Satan told Jesus if you worship me, I will give you the kingdoms of this Earth, FOR THEY HAVE BEEN GIVEN TO ME. Luke 4:5-7 Then the Devil took him up and showed him in a second all the kingdoms of the world. "I will give you all this power and all this wealth," the Devil told him. "It has all been handed over to me, and I can give it to anyone I choose. All this will be yours, then, if you worship me." You know how everyone talks about the elite who rule the world. There is quite a list, but we will not list them here. Anyway, the truth is, there is an elite group who has been ruling things from behind the scenes for thousands of years. But it isn't the Bilderbergs, the Trilaterals or any of those. It is demonic angels, the very ones who are coming to the surface of the Earth to rule with a more hands on approach in the last days. Mini, super simplified explanation, but a very important one. Adam had dominion and authority over the earth but he gave it to Satan in the garden. He lost dominion of Earth for mankind. Adam also lost mankind's spiritual and physical connection with God, and mankind then had a new connection, to the new god of this world, Satan. For the most part, man was put under a dictator, Satan. On the cross, Jesus purchased mankind's connection back to God and freedom from Satan's rule. It applies to those who have Jesus as their Lord! Those who do not have a relationship with Jesus as Lord, are still under the dictator. A believers weapon to keep Satan from overpowering their will to stay true, (connected) to Jesus is "God's Word" believed in the heart and spoken with the mouth. God's Word in your heart, mind and mouth keeps you from being deceived by Satan's lies. God's Word is the armor of God, the shield of faith and the sword of the Spirit that protects from Satan. Eph. 6:11-18. But you must have Jesus as your Lord and the Word in your heart and mouth or deception will engulf you. Like the verse above said: their minds have been kept in the dark by the evil god of this world. * The Beast seen here, in Revelation 13:1 is before Abyss Beast and little horn, join: It is a Human Empire, of Muslims world wide, it is built on 7 powerful leaders past, present and future (heads), 10 future human leaders, kings (horns) banded together and given authority, (crowned) to rule over the empire, all Islam. They will represent the empire, Islam to the leaders of the world. We are watching for this phase of the Beast to rise in the Middle East. Be advised, it may not appear until the beginning of the 7 years. But it will rise! * We know that the 8th head king, is a fallen angel. We also know that he is one of the previous seven, that he ruled before. That to me, is a compelling reason to believe that if two of the 8 head kings were fallen or satanic angels, then the other 6 must be also. The other compelling reason to think this is that the horns which are also kings are small protrusions from a head. The head is more significant than the horn. The 8th head is a satanic angel, the 10 horns are human kings. I believe reason says all 8 heads are satanic angels. When did these satanic heads rule? Since each of the early empire beasts completely overtook the one before it as I explained in an earlier lesson, and if this last Beast that Daniel saw is Islam, and it is the one with 7 heads, then all of the heads ruled over Islam. The parts of this Beast that are associated with the other empires, such as the lion's mouth (Babylon), the leopard's body (Greece) and the bear's feet (Persia) do not mean that those three empire's kings are part of this Beast. But that those three empire's land masses, the territory they inhabited are part of this Beast. This Leopard, Lion, Bear Beast with 7 Heads and 10 Horns represents where this Beast sits! Of course today, those territories are all Islam! The 5 fallen satanic angel kings began with Muhammad in the 600's. We can't name them, the Bible doesn't give us that information. We don't even have the name of the 8th satanic angel king, only that he comes from the Abyss. What does it matter anyway? The angel has told us that the 8th, a satanic angel king, is one of the 7 who is let out of prison to resume his command! Anything beyond that I believe is a rabbit trail that will most likely lead in the wrong direction. This last Beast upset Daniel and John so badly because they could see it had unbeatable strength. We now know that the strength of this Beast is satanic, and supernatural. We know now that they infiltrate even to the humans below the leadership. This is what makes the end times so terrible, you aren't just fighting against flesh and blood. Do you realize that WMD's cannot kill a Satan or any of his angels? As long as he has willing humans to work through, his plan goes forward. That is why God put a time limit of 6000 years for man's lease of the Earth. When this lease is up, Satan's sub-lease is up and at all goes back to God. Unless he can overtake God! Beast from the Abyss = the 8th leader king as described by the angel to John in Revelation 17. * This is a powerful fallen angel. He was in power in the Middle East in the past; but he was put into the Abyss and remains there until he is released at mid-trib. He then receives dominion, and authority from the Dragon in order to rule again over the empire. * He works behind the scenes, but also through a human man. * He empowers that man to take over the 10 horns of the empire so that all of Islam is consolidated under this Abyss Beast and the Dragon. * Uses the authority to command demons to enable him to ultimately win over Israel, Christians, and the two witnesses in Jerusalem. * This Abyss Beast will also wage warfare against God's angels, and overpower some. * Together, the Abyss Beast and the human little horn will pose as =Empire leader, Al Mahdi of Islam, the Caliph of Islam. little horn = mouthpiece of the Beast, also known as Daniel's little horn, Isaiah's Assyrian, Christian's Antichrist, Islam's Al Mahdi. The fulfillment of prophecy in flesh! * He will be on the front lines for all to see. * He is the one that will be admired, feared, by most. * The enemy to some: kings of the East, possibly Russia, and any dictator who wants to remain in control! Al Mahdi it appears, plunders Egypt, and destroys Saudi Arabia turning it into a land of sticky pitch (crude oil). I'm still looking into these last two, to make sure they aren't history but truly prophecy. * He overpowers Jerusalem at mid-trib. Tries to kill the Jews, but half of the city escapes out of his hands with God's help. They are supernaturally provided for by God for the last 3.5 years of the tribulation. * He and the Abyss Beast are given credit for killing the two witnesses of God, that represent Elisha and Moses. You see, the two witnesses have supernatural power during their 42 month ministry, and no man can kill them. They actually die by the power of the Abyss Beast and the human Antichrist gets the credit. But the world is pretty scared when they watch them resurrect after lying dead in the streets for three days. * This guy will be the main power-head of Islam to the world! * This is a human religious man, a prophet. He becomes a powerful accepted leader through miracles done by the Abyss Beast on his behalf. * He will likely come out of the borders of Israel, possibly out of a new Palestinian State. * He dictates all religious beliefs, criteria of worship, observance of Holy Days, and moral laws people must live by. * He institutes an ID system for everything from banking to travel. No one will be able to move around freely. * He is given so much authority that he can have people put to death, beheaded, if they disobey. * He makes fire come down from heaven along with other miracles by the power of the Abyss Beast. * He creates an image, an icon, in honor of Al-Mahdi and Allah and demands all to do the same. * He causes this image to speak and put people who refuse to worship IT to death by power of the Abyss Beast. * WHO HE POSES AS is a big question. There are a couple of answers from Islam. One is = Isa (the Prophet Jesus) Isa is a prophet of Allah, he is a Muslim, not a Jew or a Christian, purely human, not God's son, never crucified, and not a savior. Islam is waiting for him. This Isa will claim to be the Jesus of the Bible, denounce Christianity and everything that is believed about him. He will say that Allah is God, and instruct all to worship Allah. Two = The Koran talks of a Two Horned One, a mighty prophet. Only there is disagreement on exactly who he is. Some in Islam think he is a historical person, either Alexander the Great, or Cyrus the great Persian King. Some think he may be a future prophet to come, but no details. He is somewhat of a mystery to Islam. So, our False Prophet has no real identy as of yet, but he won't likely be a Jew or Christian, the Antichrist hates both and so does Satan. But he will be a religious man, who claims to speak on God's behalf. If Islamic, maybe an Imam. Please take a look at what some famous people had to say about Islam. Whatever you do, be sure to read the last one, titled a favorite. * “During the thousand years that included the careers of the Frankish soldier and the Polish king, the Christians of Asia and Africa proved unable to wage successful war with the Moslem conquerors; and in consequence Christianity practically vanished from the two continents; and today nobody can find in them any "social values" whatever, in the sense in which we use the words, so far as the sphere of Mohammedan influence. There are such "social values" today in Europe, America, and Australia only because during those thousand years the Christians of Europe possessed the warlike power to do what the Christians of Asia and Africa had failed to do - that is, to beat back the Moslem invader.” Theodore Roosevelt. * Gregory Palamus of Thessalonica (1354) wrote "The Muslims live by the bow, the sword and debauchery, taking slaves, devoting themselves to murder, pillage, spoil, they believe God approves of them." * Sir Robert Anderson argued for: the rise of power with Iran, Iraq, and Turkey as the great kingdoms who seek power in the end times. Anderson added that the Levant, Mediterranean Sea from Turkey to Egypt, and not the Adriatic, (Balkan peninsula), Jerusalem and not Rome, is the center of the world in the End Times. * Cyril of Jerusalem (315-386) said the antichrist will come from the Middle East is certainly not new. * Sophronius, Patriarch of Jerusalem (560-638) identified the Muslim occupation of Jerusalem and the Temple Mount as the fulfillment of the "abomination that causes desolation" that is always associated with the coming of the antichrist." * Other names can be mentioned such as Maximus The Confessor (580-662), John of Damascus (676-749), Eulogius, Paul Alvarus, and the Martyrs of Cordova, as well as Martin Luther can be added to the list. * “Islam makes it incumbent on all adult males, provided they are not disabled and incapacitated, to prepare themselves for the conquest of [other] countries so that the writ of Islam is obeyed in every country in the world. But those who study Islamic Holy War will understand why Islam wants to conquer the whole world…. Those who know nothing of Islam pretend that Islam counsels against war. Those [who say this] are witless. 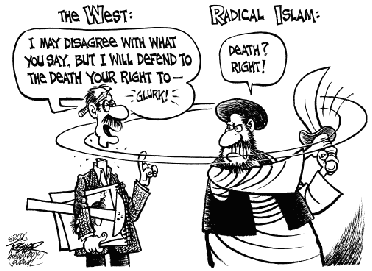 Islam says Kill all the unbelievers just as they would kill you all! Does this mean that Muslims should sit back until they are devoured by [the unbelievers] Islam says Kill them [the non-Muslims], put them to the sword and scatter [their armies]. Does this mean sitting back until [non-Muslims] overcome us Islam says Kill in the service of Allah those who may want to kill you! Does this mean that we should surrender to the enemy Islam says Whatever good there is exists thanks to the sword and in the shadow of the sword! People cannot be made obedient except with the sword! The sword is the key to Paradise, which can be opened only for Holy Warriors! There are hundreds of other [Koranic] verses and Hadiths [sayings of the Prophet] urging Muslims to value war and to fight. Does all that mean that Islam is a religion that prevents men from waging war I spit upon those foolish souls who make such a claim.” Ayatollah Khomeini 1942.